Set in an unknown, unimportant time and place, Blue Valentine is the story of a couple, Dean (Ryan Gosling) and Cindy (Michelle Williams). As well as their young daughter, Frankie (Faith Wladyka). The story, in the direct sense is about their first meeting, their falling in love, marriage and eventual divorce. However, the film never plays it that straight. And it doesn’t always limit itself to questioning only their relationship. It goes beyond one couple's existence, inevitably analysing the notion of what love can mean between any two people. Beginning in (their) present day, Valentine cuts back and forth between past and present deftly, juxtaposing the beginnings of the characters and their relationship alongside exploration of their current situation. Straight away, it seems we as an audience should celebrate that such a narrative is not sullied here. It may dwell in one place for a short while, but soon enough, a corresponding previous memory is upon us, without warning or patronizing title cards. I would say you have to try to keep up, but ultimately the film is so well versed in its own structure, that I do not have too. Everything is obvious and it is perfectly timed. The remarkable editing seems to exist to merely complement us. A scene where Dean notices Cindy for the first time for example, is ended suddenly, only to reveal its importance many scenes later in her back-story. The subtle achievement of this moment is surely one wannabe directors will consistently admire. The film making style is at one with the material, never overly intrusive or jarring, but devastatingly close. A fly on the wall account of the burgeoning and demise of a relationship. Simultaneously. One of it's strengths, besides the performances of our two leads, is the latter realisation. Mainly because though a handheld approach is the chosen display, we are not in mile-a-minute Paul Greengrass territory; we’re simply there. In the midst of the turmoil and indeed, the happiness of these people, it takes full advantage of the technique. As the film goes on, this typically modern day approach becomes essential, almost profoundly necessary. Ryan Gosling and Michelle Williams give performances that can only be described as remarkable, disturbing and uber-real. To question if real life experience had come into play for their research is declaring the obvious. They are almost too real as the battered, once intensely in-love couple. Flawed and perfect like all of us. Thus, the achievement of Valentine lies just as much on their shoulders as it does the young director. You cannot fake what happens in this film and anybody who has ever experienced a long-term relationship, whether in a positive or negative way, will no doubt have some scenes resonant uncomfortably. What is ad-lib and what is script essentially becomes a blur, only leaving you knowing that in both ways, it comes from a real life experience, and not something Hollywood would ever bank on. 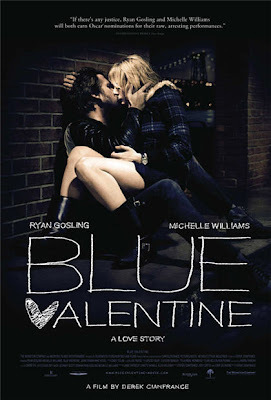 To try to give an overall impression of the movie, intensity in every scene seems to be the goal, and Blue Valentine is not for the faint hearted - even for drama addicts. And after the flamboyant end credits roll, you could walk away filled with the satisfaction of what films still have the power to do. Nevertheless, you could also possibly be scarred, or perhaps left to dwell on memories you did not want to disturb. Maybe you would walk away hating these people and the film, cursing the realism of (director) Derek Cianfrance’s world. If, in 2010, a film can do all these things and remain still, at its core, a remarkable piece of art, it deserves praise from me.